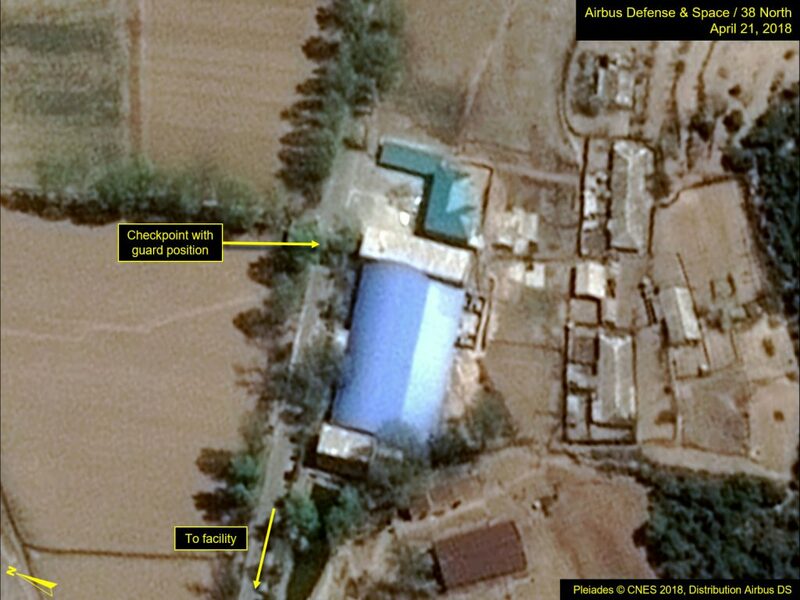 Recent commercial satellite imagery analysis by the Center for Nonproliferation Studies at the Middlebury Institute for International Studies, published by The Diplomat, identifies what is suspected to be a uranium enrichment facility in Chollima District, Nampo City. However, while the intelligence community has been monitoring this site for more than a decade, its actual function is still in question. It does have some of the characteristics of a site for production of weapons grade material, but a variety of contextual factors, especially the location, suggest it has been built and is being used for some other purpose. A recent article in The Diplomat reported to have found what is suspected to be a covert North Korean facility for processing highly enriched uranium in Chollima District, Nampo City. The article describes a large industrial plant “assumed to contain the main gas centrifuge cascades, which output uranium highly enriched in uranium-235 and suitable for use in nuclear weapons.” It also identifies a long driveway, security fencing, a monument of Kim, what appear to be residential apartments, and the presence of trucks and other vehicles. According to the article, this facility may have been in service since the early 2000s. In some ways, the facility seems well-suited for uranium enrichment. Because of its location, the site would be optimal for DPRK scientists and technical personnel to conduct experiments; they would have ready access to convey documents and status reports to Pyongyang and easy access to Kim Chaek University, Kim Il Sung University and the State Academy of Sciences, where technical resources or personnel can be accessed. However, that is not how working-level experts or personnel in the DPRK’s WMD programs operate or function. There exists also the probability that an off-the-books uranium enrichment facility was constructed in Nampo. However, scholars and subject matter experts approaching the North will sometimes fall into a trap of thinking the country plans, behaves and functions like other nuclear weapons powers. This might hold true for technical and industrial processes, but not in terms of deployment, policy planning and the organizational behavior and psychology of the core leadership. That said, The Diplomat article presents little tangible evidence to support the claim that the Kangson site is a uranium enrichment facility or contributes components, parts or technology to North Korea’s WMD program. There is nothing particularly remarkable about a DPRK industrial facility with security fencing, worker housing and Kim iconography. There are scores of industrial and commercial plants throughout the country with these characteristics. The piece also fails to consider logistical and political factors that argue against a role for Kangson in nuclear material production. When trying to assess whether Kangson may be a uranium enrichment site, the first consideration is the construction of the facility itself. Construction and engineering personnel for nuclear facilities, industrial and critical infrastructure and uranium mining and milling are under the jurisdiction of the Korean People’s Army (KPA) 620th Brigade and the 41st Brigade, which are technically subordinate to the Workers’ Party of Korea (WPK) Munitions Industry Department and the Party’s Second Economy Commission (Second Economic Committee). The 42nd and 43rd Brigades, subordinate to the 620th, are stationed in and around Yongbyon and are involved in excavation, engineering, construction, framing and finishing of nuclear facilities there and in the surrounding counties. This is not a routine construction-related human resources allocation, such as for a hydroelectric power station or recreation facility (like a ski resort). Rather, these are specialized construction and engineering units that if deployed to Nampo, would create a distinct footprint in satellite imagery. Moreover, that type of deployment would have surfaced through alternate information channels (human intelligence, defector debriefings or open sources). A uranium enrichment facility is also not a sporadic years-long project. This is a major personnel deployment that requires significant resource allocation. Considering the logistical and personnel requirements, it is easier to build an off-site in North Pyongan Province, in relatively close proximity to Yongbyon. Thus, some sources have pointed to, and some analysts have poked around, Pakchon and Taechon Counties, west of Yongbyon. Second, there is the question of physical access to the facility itself. There are two major concerns here: first, preventing ready access to the facility (i.e., someone making a wrong turn or a rogue actor being able to commit theft); and second, having the ability to shut off access to and from the facility in the event of an industrial accident. 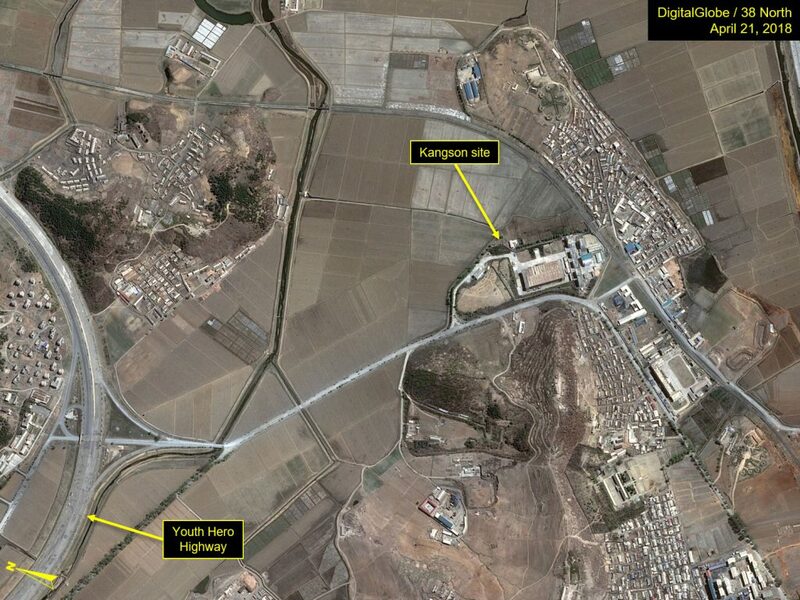 The alleged uranium facility is situated 1.4 km (.84 miles) from the Pyongyang-Nampo Highway. A view of the area shows a highway turnoff and an access road from the highway to the facility that does not have any type of gate or barrier, or any evident inspection post to form an outer security line before entering the facility’s main gate. Figure 1. No security on highway turnoff or access road to the suspected Kangson uranium enrichment facility. In commercial satellite imagery of the facility from April 2018, there is a gate and security building at the main entrance. There is a fence between the gate and a vehicle and personnel trench that traverses the wall around the facility. As far as security gates go, the one at the Kangson site is a factory gate typical to many industrial sites in the county. The security building is not a hardened garrison, but also appears to serve as an administrative and property management facility. The vehicle/personnel trench indicates that the on-site security personnel are mobile and fairly few in number. These security measures are more in line with a production unit or facility for component parts or technology, not a highly sensitive uranium enrichment facility. Figure 2. 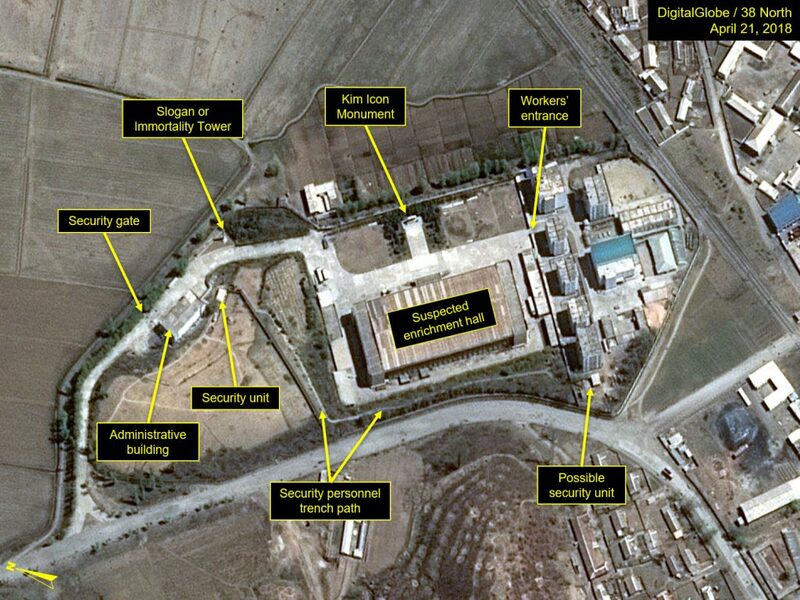 Security to enter the Kangson facility is typical of other North Korean industrial sites. 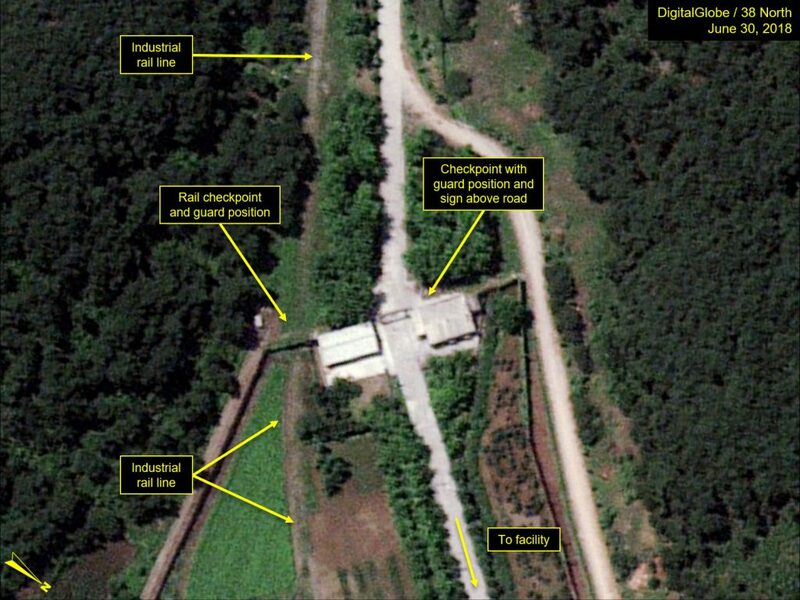 In contrast, the Tae-sung Machine Factory, located two miles west, has outer checkpoints and inspection posts, in addition to a large reinforced main gate. This missile factory is not only located further in from the highway at 2.3 km (1.45 miles), but also has numerous natural defenses including heavy foliage, trees and mountains surrounding the facility. The alleged uranium enrichment facility has none of these additional natural barriers, though it would stand to reason that there would be similar, if not greater, security measures in place. Figure 3. Greater security and natural defenses for the nearby Tae-sung Machine Factory. While much larger in size, the outer security lines at Yongbyon, where North Korea’s nuclear reactors and known uranium enrichment facility are housed, are protected by well-attended inspections posts 4-5 miles away from the nearest enrichment facilities. Once inside the Yongbyon complex, even employees have to pass through multiple security inspection posts and checkpoints, including to gain access to individual buildings. Figure 4. Main security checkpoint at the Yongbyon Nuclear Scientific Research Center. Figure 5. 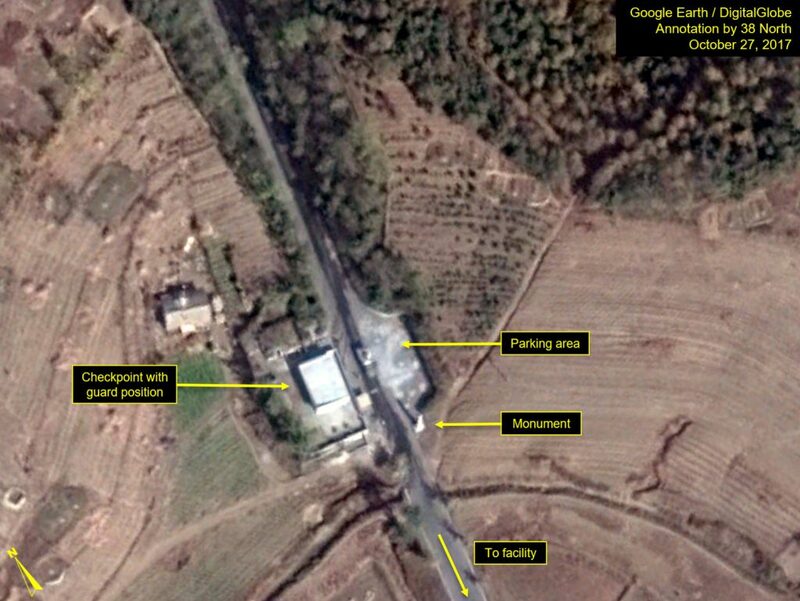 Example of inner security checkpoints at Yongbyon’s key facilities. The facilities at Yongbyon are admittedly high profile. Whereas, the location of the Tae-sung Machine Factory—a legacy munitions industrial plant—is somewhat anomalous because of its proximity to a large highway between Pyongyang and Nampo. Most other WMD research and production facilities follow a three-pronged approach to security and physical access, due to the secret nature of the work involved and the need to maintain tight control over access to the facility. First, research facilities and production units are almost always located in relatively remote geographic areas., For instance, the headquarters and major offices of the Second Economic Committee (SEC), the production and manufacturing arm of the DPRK’s strategic and conventional weapons, are located 45 km (30 miles) from central Pyongyang. The Second Academy of Natural Sciences (SANS) and the Sanum-dong research campus is 15 km (10 miles) from central Pyongyang. These are major research and production bases for WMD and do not account for the isolated and closed parts of North Pyongan and Chagang (Jagang) Provinces where the bulk of North Korea’s nuclear and ballistic missile production takes place. Second, all of these facilities have a high number of guard barracks and inspection checkpoints and enjoy the protection of natural defenses. Yongbyon is surrounded by water. Other weapons research and production facilities are located between mountains and foothills. Heavy foliage and tree plantings usually line the roads and the outer perimeter of the buildings. Finally, based on cumulative interview data from defectors and migrants, personnel involved in nuclear weapons and ballistic missile research and production are deliberately isolated from the rest of the DPRK’s population; they are subject to rigorous Party Life assessments and routine indoctrination and are closely monitored by party cadres, notification personnel, the State Security Department and the Military Security Command. These three general security measures reduce the probability that the industrial plant in Chollima District is a uranium enrichment site. First, it has minimal security measures and is next to a major highway. In contrast to almost every other WMD facility in the country, it is located in a relatively open part of the DPRK, only eight miles from Lake Taesong, which has a public golf course and the Taesong Guest House. There are several other reasons why the DPRK leadership would not place a uranium enrichment facility near the Pyongyang-Nampo Highway or near to either Nampo or Pyongyang. The Pyongyang-Nampo Highway is a key southern defense route for the Pyongyang Defense Command and III Army Corps. In the event of a domestic or foreign attack (from the South) on the DPRK, the 107th and 108th Tank Divisions deploy on the highway to cut off access routes into Pyongyang. Any initial air attack against the North, even a “bloody nose” strike, would target nuclear facilities. The DPRK’s core leadership and Korean People’s Army (KPA) planners would not likely expose this key defense area to an air attack. The KPA also keeps open an escape route to the south; in the event of a decapitation strike (targeting central Pyongyang), core leadership could attempt to migrate to Nampo and leave the country via ship. Moreover, the road running south of the Kangson facility, along with the southwestern part of the Taedong River, is a key civilian and military logistics route. Goods and products come from factories in Nampo, its suburban districts or off the boat in Nampo and move north toward distribution networks in Pyongyang. The Taedong River and the southern road mark the last six miles of a critical KPA logistics route that begins in Pyongchon District, Pyongyang; using a combination of shipping vessels and trucks, various necessities and supplies are routinely moved to an underground storage facility on the eastern bank of the Taedong. This is a heavy traffic area for several populations in the DPRK—the civilian economy, the North’s conventional armed forces and foreigners (tourists and residents in the DPRK). This greatly reduces the probability of DPRK policymakers and planners situating a uranium enrichment facility in this area. The risks of an industrial accident, however remote, far outweigh any benefits derived from convenience or efficiency. While there is a general belief that North Korea likely has covert uranium enrichment facilities, there are several contextual considerations that make Kangson an unlikely candidate, or at least a security anomaly if it is. What then is the Kangson facility? Considering its relatively minimal security, close access to a major highway and proximity to a major missile factory it’s probably an extension of the Tae-sung Machine Factory. Admittedly, there is no definitive proof for this assertion, but the contextual evidence raises serious doubts on the role of Kangson to North Korea’s nuclear program. The Diplomat article alludes to a “U.S. government source” who stated that this corresponds to the site that the USIC calls the “Kangson Enrichment Site.” One rule of the road for intelligence professionals is that these are estimates. Agencies within the intelligence community provide different analyses and estimates based on what disciplines of intelligence they are using (human, signals, measurements, geospatial, all-source, open-source), how and what they collect and the sources use. Even within agencies and across the whole intelligence community, dissenting and competitive analyses are not only welcome, but encouraged. It presupposes that the DPRK had an inventory of thousands of centrifuges during the early 2000s. There are a number of component parts and materials that are necessary for uranium enrichment—such as maraging steel—that would meet the technical specifications to produce rotors. In order to manufacture these centrifuges, the DPRK would need flow forming machines. During the late 1990s and early 2000s, there were several dual-use, even nuclear-related, imports into the DPRK, but the country had not yet attained this industrial infrastructure. The imports were most likely part of a kit through which the country developed its own homegrown capabilities. One externally used name for these military units is KPA Unit 131. The 47th Brigade is responsible for uranium mining and milling and is located in Pyongsan. The 620th Brigade consolidated the 42nd, 43rd and 48th nuclear construction and engineering brigades. It was established in 1985, carved out from DPRK Cabinet and KPA General Logistical Department construction, and engineering construction units. The 41st Brigade installs and conducts assembly finishing for nuclear-related machinery manufactured at industrial plants. An inspection post is a small facility located near VIP or strategic locales throughout the DPRK where a vehicle’s license plate and other decals (such as specific colored stickers on the hood or near the license plate) are checked. Vehicle occupants are also asked to furnish identification or requisite travel documents. Some inspection posts are tiny and have only one or two security personnel at a modest booth, others can be small, fortified structures with up to a dozen personnel. The small-scale nuclear physics and chemistry research facilities subordinate to the State Academy of Sciences are located 15-20 miles (27-29 km) from Pyongyang’s city center in the closed Unjong District and Pyongsong, the provincial capital of South Pyongan which has only recently been more widely open to foreign visitors. Part of this is due to the fact that highly educated intellectuals and well-trained laborers are part of a larger population of DPRK citizens upon whom the Party exerts tighter social controls (the same applies to journalists and musicians) because they encounter and have access to “outside information,” but also to thwart defections or crossing into another country and becoming a well-paid human source. The Taesong Guest House is a VIP residential compound. Set on Lake Taesong, it is a resort and banquet facility used by members of the DPRK leadership and has also housed foreign VIPs visiting the DPRK and taking advantage of the golf course across the water. This is a contingency plan of the last resort for DPRK leadership. Nampo is a key DPRK port with a consistent international population staying or traveling in that city. Pyongyang has much of the DPRK’s international expatriate and foreign personnel population. Any industrial accident that could happen at a uranium enrichment facility would affect the foreign population. This would be an international embarrassment that the North would not wish to incur and could form the basis, however specious, of a military invasion.